Goldmine! Turn Key Business With INCREDIBLE Revenue And VERY Low Rent. Highly Visible Location In A Freehold Building On One Of Oshawa's Busiest Intersections. 26 Parking Spots Plus Over 80 Spots Combined On The Lot. 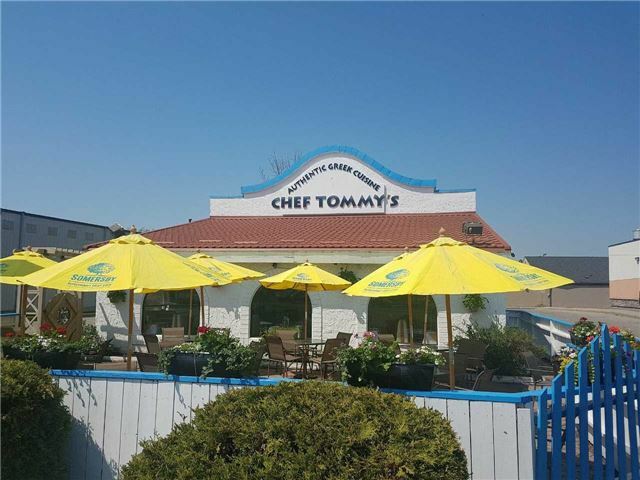 Currently Serves Authentic Fine Dining-Casual Mediterranean Cuisine. Kitchen Includes: Separate Cooking Area, Separate Dishwashing Area, Walk In Fridge, Freezers, Staff Washroom, Laundry Area. Don't Miss This Opportunity Of A Lifetime! Great Lease**5 Years Plus 5 Year Option Remaining. Very Low Rent. Potential To Open 7 Days And More Hours. Currently Open 5 Days 11Am-9Pm.Huge Licensed Patio Seats 55 People. Owner Willing To Stay And Train. Selling Due To Health Issues. Contact Listing Agent at haroula1978@yahoo.com for more info.